My dear Prabhujis, Please accept my humble obeisances _/\ò_. All glories to Srila Prabhupada! Not many people know about it, but every year on Ganga Dashera and Pandava Nirjala Ekadasi there are Phul Bangalas (Flower Palaces) and Kavi Sanmelans (Poetry Recitals) in Varsana and Nandagram respectively. Mostly just the local people come and a few outsiders, but it is a truely wonderful ecstatic experience. 3:30 AM as my alarm clock. In the distance the peacocks also begin to cry. One visting devotee had his cell phone with him the other day and it was my daughter’s birthday, so I called her directly from Vrinda Kunda. As we were talking, the Kokila began his famous song. “What was that!” she exclaimed, “It was so beautiful”. I told her that was the Kokila singing. Just then a flock of Vrinda Devi’s parrots flew by in full chatter mode. “Where are you?” she asked. I told her that I’m calling her directly from Vrinda Kunda. Some more birds began their singing. She was hearing it all over the phone. Prabhupada told that the singing of the birds in Vrindavan is more auspicious than hearing the Vedic Verses. 8 pm and the festivities had just started. 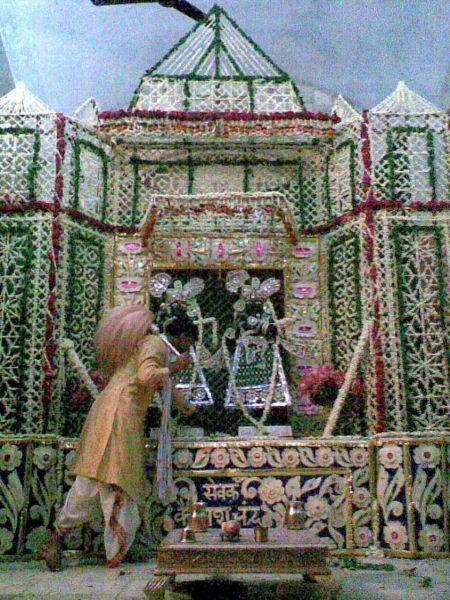 There was an elaborate flower palace woven with jasmine and mogra flowers stretched accross wooden frames in the darshan mandap as the Deities were there outside Their altar. The fans in the temple room wafted the fragrance to the four directions. This year was the earliest monsoon in 108 years and it had started the previous day, so the atmosphere was quite cooling. This was highly unusual since mid June means the temperature never goes below 45 C (over 120 F). All the brahmins from Varsana were sitting on one side and the brahmins from Nandagram on the other in the courtyard facing each other at the Lotus Feet of Sri Sri Ladli Lal. Both sides had two microphones and they began reciting very sweet verses of Brijbhasha poetry. Dhanya Brijbhasha, dusri na bhasha, te ne vani ki vidhata ko bolbo sikhayo hai. Glorious Brijbhasha, there’s not another like it. You even taught the iventor of language how to speak! Some recited old verses and others recited their own compositions. One would immediately be inspired by the other and the next one would take a cue from the last verse spoken and start another. Even if you don’t understand, Brijbhasha is so sweet to hear. Now I can understand about 80% of the words and maybe 40% of the meanings, but it just takes you to Goloka Vrindavan. We had planned to stay only an hour, but we stayed up till 10 PM when there was aratika to end the program. Very wonderful mahaprasad was distributed to all. Then next night was Nirjala Ekadasi and the festival was at Nandagram. 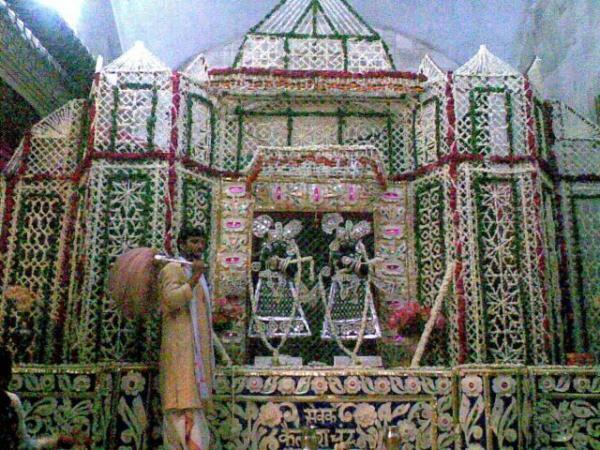 They bring the Deities of Krishna Balaram around to the side altar where a beautiful phul bangala was made. Somehow although usually they don’t allow photos at all, we saw several people were snapping away with their mobiles. So my driver Gita Govinda whipped his out and got some photos for me to show you. Of course these are cellphone photos, so the quality is not the best, but anyway you’ll get the picture! But the kavi sanmelan was a failure. The Nandagram pujaris didn’t arrange for a sound system. All the Varsana Brahmins were seated facing the Nandagram brahmins in the courtyard waiting for a sound system that never arrived. They went on anyway, but unless you were sitting directly with them it was impossible to hear over the noise of the pilgrims and children. It was a big embarrasment in front of the Varsana brahmins who had made such a nice arrangement the previous night. The phul bangala was glorious with the sweet scent wafting hear and there. So after taking darshan to our full satisfaction, we returned to take rest at Vrinda Kunda.